I’m laptopping you from beneath a red-painted tori on the edge of Lake Ashi in Hakone National Park, Japan. Nearby, an elderly man is mixing bright powders from plastic bottles in a small bowl and stirring with a long-handled spoon. A small panel lies in front of him on a pillow of moss–his subject is the gradated reflection of Mt. Fuji as seen between the tori pillars. His big, badger-hair flat, well loaded, sweeps back and forth. 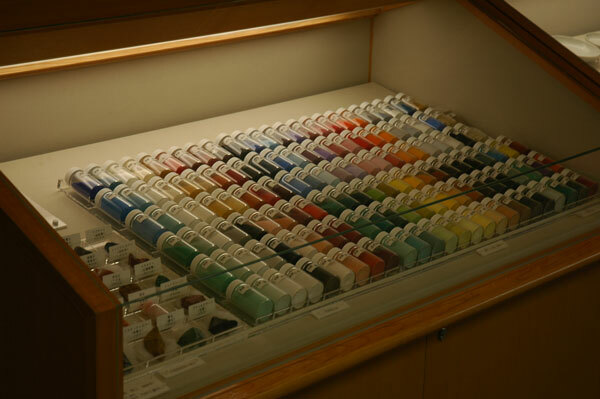 Imagine a painting system with its roots in the past that takes its palette from naturally-found minerals, shells, corals, rare earths and semi-precious stones. These materials are ground in 16 consistencies from very fine and powdery to downright sandy and rough. Bind these, a batch at a time, in a ritual bowl using water-softened animal-hide glue and apply the mixtures using a range of traditional brushes. 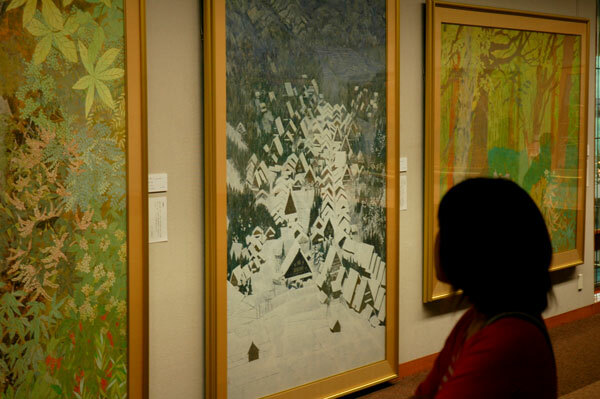 It’s called “Nihonga” and it means “Japanese-style painting.” Developed in the Meiji Imperial Era, these days it’s pretty hard to go to a museum in Japan without running into Nihonga. Its current masters, many of them young, attend their solo and group shows and sign favor reproductions and cards. The surfaces of Nihonga range from flat and print-like, to a build-up of sugary or gravelly textures. 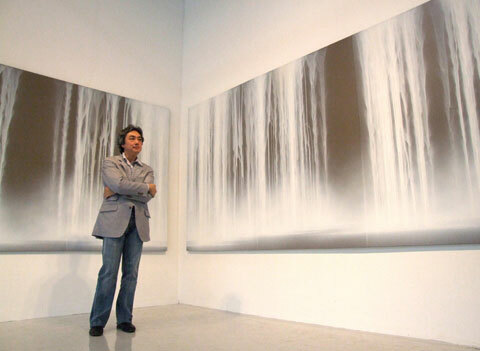 Many works show the conventions of soft edges and gradations. Gradations soften hairlines, the feathering of birds, and make the water lay down on the lake. 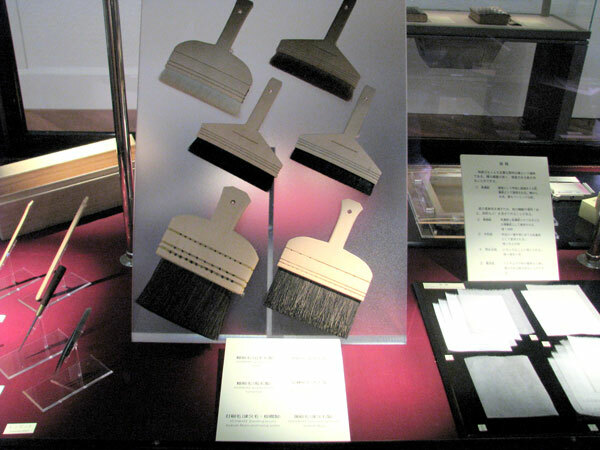 A round, flat-ended goat-hair, like a stencil brush, often serves this purpose. Surfaces are sometimes pounced and stippled. No show passes without a view of Mt. Fuji. 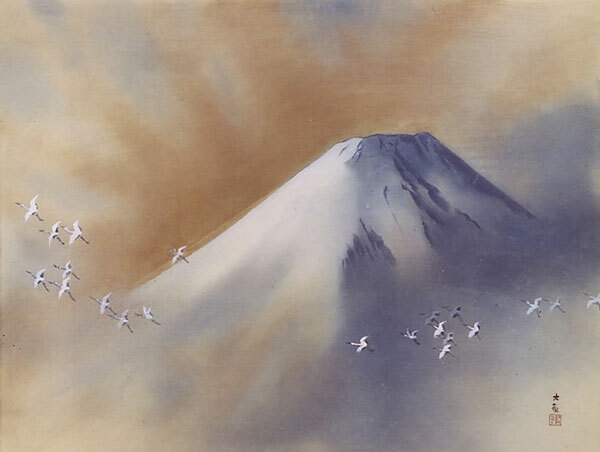 An icon of Japanese art, Fuji has built-in symbolism, symmetry and opportunity for gradation. With the exception of counter-lit and moonlit subjects, Nihonga tends to avoid the business of light, shade and cast shadow. The experience is often like looking out on an overcast day, yet defying the colours of reality. Greens can be particularly surreal. Even renderings of Mt. Fuji may show a harmony of tones unrelated to life. 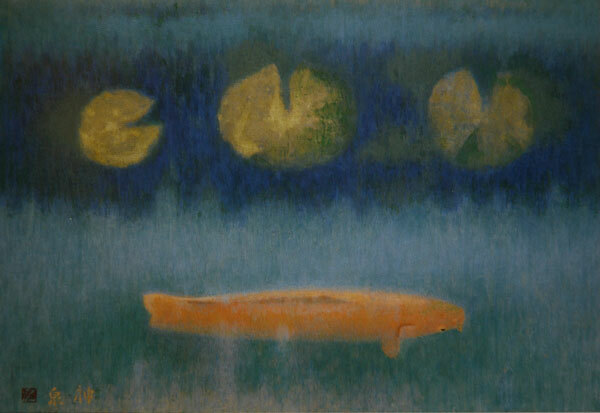 Typical is a blue-gradated Fuji under a gray-gradated sky hung with an orange-gradated moon. The combination of the soft, blended edge and the use of gradations characterize a lot of Japanese art. Gradations were one of the features that first attracted and stimulated the Impressionists. The wood block print, a hard-edge art if there ever was one, was the first Japanese art to find collectors in Paris. The attractive blends were achieved by rubbing on and feathering off. es slowly, ritually, like an elderly server in a tea ceremony. His back is straight, his eyes attend to his business, his long fingers are full of wisdom. Esoterica: The convention of gradation also has domestic applications — clothing, product design, signage, packaging. From electrifying razzle-dazzlers to sophisticated grays, blends are everywhere. 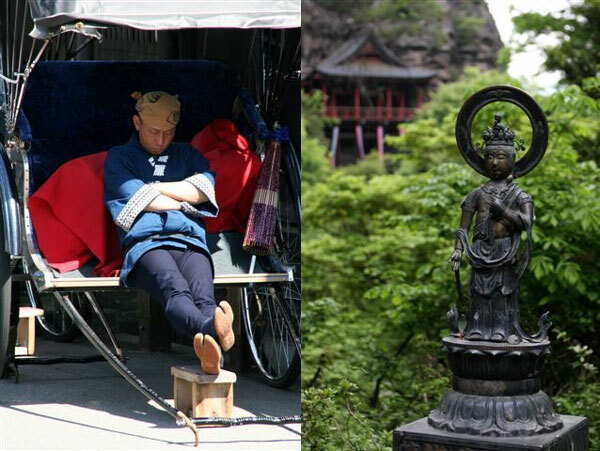 Blends add sweetness, tranquility and grace to the wabi (simple and quiet contemplation) of Japanese life. Reading your description of Hakone National Park and the view to Mt. Fuji makes me miss the diversity and beauty of the country even though my husband and I just returned from a trip there within the past month. While my husband delves into the editing of 7500 plus digital photographs of “quintessential Japan,” I have strayed away from my usual motif in watercolour to tackle a beautiful Maiko (apprentice Geisha) of Kyoto. 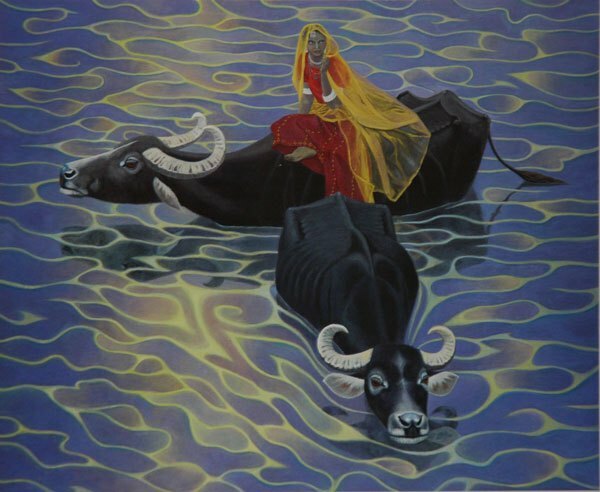 The country, its sites, people, food and aesthetics could surely motivate any painter with its impression overload. Yet, like all countries, Japan is evolving and much easier to get around than 21 years ago when we first visited. Through exploration and the diversity of “finding one’s way” in a foreign country we can then bringing those stimulating memories home to assimilate them. There’s an artist in Japan that is shaking up the ‘Nihonga’ school. Her name is Matsui Fuyuko (or Fuyuko Matsui in English). 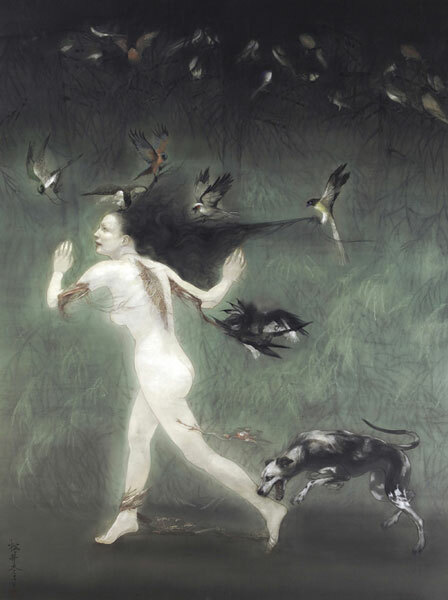 She paints in the Nihonga style and her subjects are usually related to traditional Japanese themes but she brings an alarming twist to them. Older methods are charming for an older time not today. The past is the past. Unless there is a definitive link of passing down the tradition it should be shelved in a museum and appreciated. The current trend to “re-create” the method and style of the masters past is a feeble attempt at best and rarely ever creates anything worth noting. Mostly lots of really, really bad art. The context is wrong and lack of skilled hand is wrong. 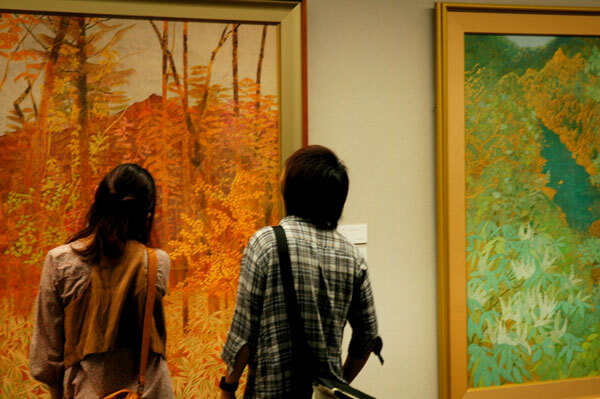 Have you ever visited one of these galleries that are showing the new masters? I find they are attractive images but often lacking any emotion beyond pretty, campy, and rather embarrassing in their overall silliness. Paint and painting is to paint for today not for yesterday. Besides we all suffer from a huge ADD complex with our ever increasing distracted world. Okay, I hear ya. We have to assume and and all our work is derivitive. The only way it couldn’t be is if we were born to and raised by something other than humans. But tell me, what is the next step? What comes after Jackson Pollock, Rothko and bloody Andy Warhol? In this historical context of “art speaking to art”, what is the next chapter? It is said the originality is merely an obscurity of the source. Are we not being obscure enough? As I have been struggling with these questions for years, I’d REALLY like to know. That’s what we all do, James, paint for today. The way we see today is different though. You and some see it as avant-garde, other see it as a return to the past. Our hopes for the future are different as well. Why would you feel that other’s hopes are embarrassing? I find attempts to be different to the point of insane is hilarious. We are all different, yet same in some way…the way that we all need to live in peace and respect each other. Right on the money, literally. 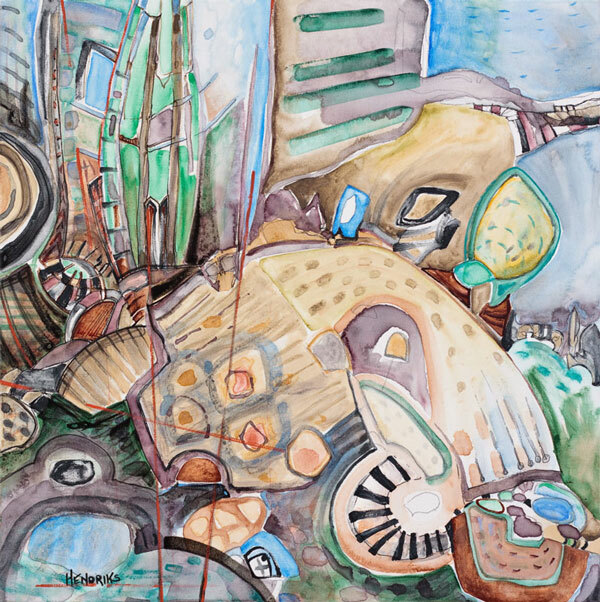 Many who award themselves the apellation “artist” are far from that, telling me they are “impressionists”, “abstract expressionists” – I usually say “and you’re still alive! Amazing.” These are folks who are afraid to take risks and grow into their own work. Taking risks is the scary part of art-making. Unfortunately casual buyers are most comfortable with safe work. This is very funny. I am a collector. I buy beautiful art. Why would I invest my money into someone’s risk taking? Your risk – your money, isn’t that fair? In my art course last year we were studying tenebrism and chiaroscuro. 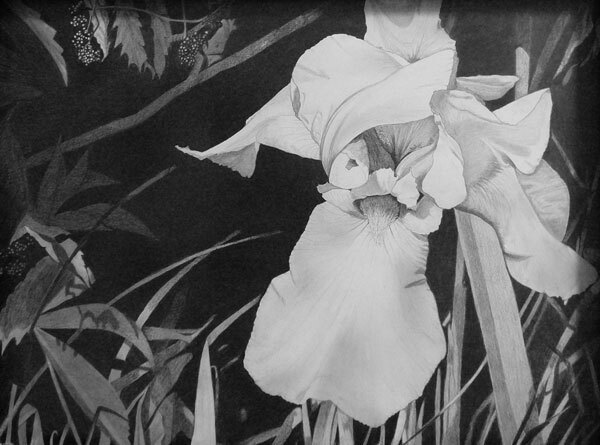 I had been working diligently on a graphite composition of an iris in my mother’s garden; each time I thought I was finished, my instructor would say, “I don’t see any black there” and back I’d go to working it over and over again. I was pleased that she made me persevere, and when we did our peer critique I was at first dismayed and then amused when a Chinese student (who did beautiful paintings) broke from the pattern of softly spoken platitudes which seemed to be the routine, and said “That would NEVER sell in China! No one would want a piece like that! The edges are too sharp and harsh,” etc. Even though the goal of the project had been made quite clear, he couldn’t accept that style of art (his was a wonderful drawing, but did not exhibit any tenebrism). 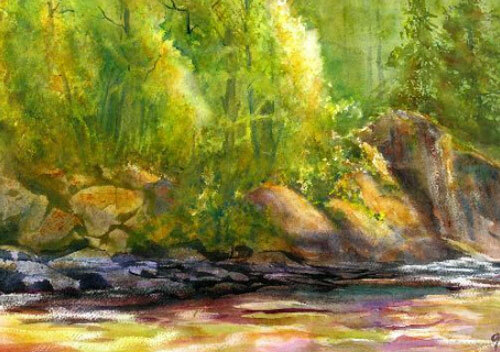 He had exceptional talent in rendering realistic paintings, too, but he never could follow the instructor’s assignments, merely painted and drew his wonderful work in his own style, resisting any change (or growth); I must admit, when I took a subsequent art course, I resisted abstract art just as thoroughly! (RG note) Thanks, Petrina. Tenebrism is derived from an Italian word which means violently contrasted lights and darks. Caravaggio was a big believer in tenebrism. Thanks, Robert for the note about tenebrism – saved me from googling it!. Petrina, thank YOU for that exquisite Iris – blissful black, indeed! This was a very insightful letter except for one detail. You said “resisting any change (or growth).” This is a very culture insensitive comment, although probably not intentional. There are many ways to grow, and some cultures nurture deep learning while other promote wide knowledge. Your Chinese colleague was most likely dedicated to the depth of one style. You can spend the same energy or a lifetime to learn about the world, or about one subject. My husband uses animal hide glue on his Native American Stone Knives. Here in Florida, the giant palmetto roaches want to eat his work. How do the Japanese preserve work painted with animal hide glue? (RG note) Thanks, Lisa. I don’t know the answer to that one. They claim a thousand year life for the animal hide glue. Some Nihonga painters use glue made from fish bones. FYI, the glue comes in little brown units a bit smaller than sugar cubes and dissolves in the water fairly quickly. Fact is, insects like a lot of glues and sizings. It’s a hazard. I have 4 acrylic painting panels that I will be shipping to the hot/humid country of the Dominican Republic. They will be hung in a clinic in a barrio, where the surface will need to be protected by some type of varnish. What varnish would you recommend for acrylic painting? 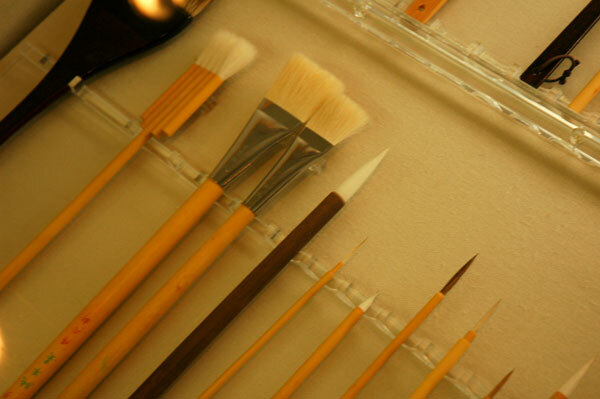 The painting surface is gessoed Leuon, with many thin layers of acrylic. For my shipment of panels what should I place on top of each painting to protect when shipping where it will be very hot? Which is best; brown paper, plastic wrap, sheeting? (RG note) Thanks, Susan. Varnish your acrylics for the tropics with Golden Final Varnish with UVLS (gloss or matt) Give it a few days before shipping then wrap in brown paper and protect with bubble wrap. Brown paper can be washed off if it happens to stick. don’t miss the brown paper or some kind of smooth barrier between varnish and bubble wrap. I once made the horrible mistake of wrapping a varnished canvas I thought was dry with bubble wrap, and the bubbles appeared all over the painting, it needed to be completely stripped. What a mess! I enjoy studying Art History, especially Modern Art, and I do scream it from the roof tops. Being a proud Canadian I study our own; although be it short; rich Canadian Art History diligently. Derivation is an action that I visit on occasion. It’s cool that Music, Fashion and Architecture can be retro, so why not Art? The indulgence of influence is really the sincerest form of flattery. If used honestly, influence can be like drinking a Red Bull — it gives you wings! Japanese art is and always has been enigmatic to me. Maybe when I’ve several centuries of discovery under my belt I might get a better grip on what they are painting. Frankly, it’s pretty and illustrative in a flowery way and, to me, has reached a level where, unless I were Japanese, I have difficulty really appreciating it. This of course is a personal choice. I much more prefer the Russian school at the turn of the 19th century. Repin, Levitan, Surikov, Kramskoy, Perov et al. Personally I like work that tells a story or has a message. Occasionally I enjoy a benign landscape for diversion. I want to see the hand of the artist in the work. See its truth and honesty. Mt Fuji isn’t the Sierra’s where I feel connected. Mt Shasta now, there is a peak. I see most Japanese art as, well, mainly wallpaper. 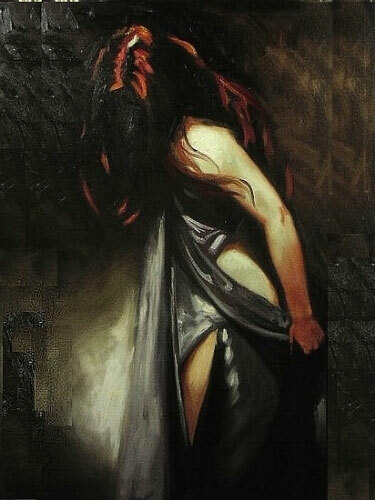 I can appreciate the esthetic qualities, but prefer to have more “meat” in my painting. Your recent recommendation regarding Richard Robinson’s excellent video on the understanding and handling of colour was first rate. Thank you for again adding another great and exciting experience to my painting education. Thank you for sharing this delightful experience you have enjoyed far away from Crescent Beach. 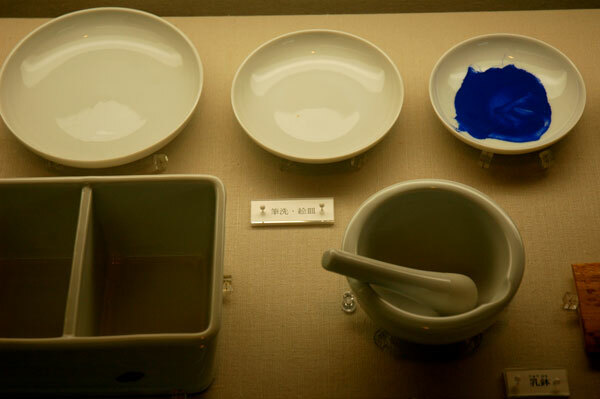 I really enjoyed reading about the Japanese art, history, and way of preparing the oils. Even the little piece gave me a beautiful look into a tradition I would have never known. Traditional sources for material can also be a great source of interest & as a result :Influence. I just returned from the Montreal Botanical Gardens: and the Japenese Garden provided great insight on Laquer , from the Laquer tree ; and then the mixings. Thank you for sharing your story about Japan and their painting.It must be very fascinating to watch the old man create his art in this ancient way and how they prepare their colors from natural sources .The Japanese are known to be spiritual and have ceremonial rituals in many things they do.It is very good that many young Japanese are following this old way of painting. Your post today is influential, especially for me. Having loved Eastern art for a while, I am attempting to paint my boggies with this influence. I like to think my work has a Japanese flare. Japanese art is and always has been enigmatic to me. Maybe when i’ve several centuries of discovery under my belt, I might get a better grip on what they are painting. Frankly, it’s pretty and illustrative in a flowery way and, to me, has reached a level where, unless I were japanese, I have difficulty really appreciating it. This of course is a personal choice. I much more prefer the Russian school at the turn of the 19th century. Repin, Levitan, Surikov, Kramskoy, Perov et al. Personally I like work that tells a story or has a message. Occasionally I enjoy a benign landscape for diversion. I want to see the hand of the artist in the work. See it’s truth and honesty. Mt Fujii isn’t the Sierra’s where I feel connected. Mt Shasta now, there is a peak. I see most Jananese art as, well, mainly wallpaper. I can appreciate the esthetic qualities, but prefer to have more “meat” in my painting. I’m excited to hear that you are in Japan! I have many students who would be interested in meeting you. I’ve been enjoying your column for a number of years, learning and reflecting on your experiences. I’d be happy to meet you if you’re in Tokyo area and show you some surprisingly scenic city nature off the beaten track. And some great art supply shops. Gradation is one of the basic principles of design. Smooth is better than jumpy or wishy washy. Implied, or partly hidden gradations are particularly valuable. Gradations carry with them the essence of appeal in a painting. The use of light and shade in paintings is a peculiar Western convention. Perhaps the more worldly West was obsessed with a sense of reality, and needed to express it, and the more ascetic and philosophic East felt it did not need. The information in these letters is worth gold. Thank you Robert for encouraging so many of the worldly wise to write in this forum. It is the best. I am going to be fuzzier in the future. In the frantic pace of life, pause here for a moment. Catch your breath, relax your body. Consider that our lives are always unfinished business. Imagine that the picture of our being is never complete. Do not let the incompleteness weigh on your spirit. Do not despair that imperfection marks your every day. Let us instead be grateful that the world is still to be created. Let us give thanks that we can be more than we are. Beautiful message. Congratulations on your exhibit. I have allowed my art to be blocked for years and years, and am trying to unlock it. I love it..and what a great name for this art! I am a big Japan fan, having traveled there twice…I learned of an art form there, called etegami? Are you familiar with this?? I love your inspirational messages…always inspire me! In observing the artwork produced by this method, I agreed with someone who said that it would be better to leave the traditional largely where it belongs, but then I followed up the link to Hiroshi Sengu’s work and it is wonderful and amazing, so I take it back! Thank you for a totally inspiring discovery. It could be, that because he considers himself more international than national, that he has been able to escape the limitations of a traditional style and brought it into the 21st century. I loved his comment about who his contemporary inspirations were: ‘Since I am an artist I am most interested in myself.’ Right on Hiroshi Sensei! RE- Hiroshi—————sorry but what is it? Looks 2 me like somebody painted a wall & forgot a few places!!! Perhaps it looks different in –real– but I don’t see the point of painting things that the public can’t understand– or admire. Anyhow— carry on– if it’s worth money–it’s worth doing!!! But I prefer subjects with meaning.